We are always excited when franchisees get recognized by the local media. Brian Winton, a United States Air Force veteran and new owner of TruBlue was featured on WDEF of Chattanooga last month He was featured to talk about the great services his business brings to this community. 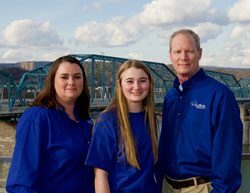 Although backed by the national branding of TruBlue, this family-owned business is run by Brain Winton along with his wife, Gail, and their three daughters, Sidney, Amber and Peyton, and their two grand-daughters, Kennedy and Kinley. Brian Winton shares his story about his inspiration to launch his very own TruBlue Franchise. When he was initially looking at franchising, his mom fell and broke her hip. Luckily, he was able to help with the home repairs and take care of her. But what if she was alone? Who would he call? He realized he would have probably had to call many different companies to take care of his mom. He saw the demand for these services and having a one-stop-shop to take care of the house for seniors and busy families. He takes pride in providing professional house care services to the community. Winton shows his commitment to quality through hiring trusted, background checked employees, so you can feel safe letting these workers into your home. Click here to visit TruBlue of Chattanooga’s website.